"Always dedicate your practice to something or someone at the beginning and at the end of the class. Yoga is not defined by the postures we do, but as 'the state of union, we experience through the practice', the union within ourselves and the union with something bigger, our connection to others...through yoga, you become a better person for others." for focused needs - weight loss, stress reduction, runners' trainng, etc. Ashtanga Vinyasa Primary Series - structured sequence to build heat, increase energy and focus. Through daily practice, impurities are removed from the mind and body. Discipline and devotion is developed in time and makes the body fit and strong as energy flows freely. Vinyasa Yoga - dynamic flow linking breath with movement, builds heat, strength, and flexibility through challenging sequences of asanas (postures). Helps you find your edge between challenge and acceptance. Yin Yoga - perfect complement to Ashtanga Yoga. It provides a deeper stretch through holding of the pose for 3 to 5 minutes. Yin yoga targets the connective tissues and emphasizes internal heat and lengthening of muscles. This is a slow and thoughtful class with gentle moves developing softness and surrender. It allows the students to develop a deeper sense of inner clam. Themed Yoga - yoga for runners, for stress relief, for weight loss, etc. (Dec 10, 2014) Miss Jeanne is my first yoga instructor before I became one.. all I can say, she is a very wonderful teacher. Her passion and compassion inspired me to continue learning. She is very gentle, friendly and kind. She would never push you to the limit but helps you understand and listen to your body. I learned many techniques from her. She is truly an inspiration to me. (Dec 10, 2013) If you are new, Jeanne offers the best introduction to yoga. Her unhurried method of teaching easily gives you confidence to continue and improve your practice. She took her time to teach me headstand and even made me do it four times in one class! I look forward to her Wednesday and Friday classes at Gold's gym, work schedule permitting. 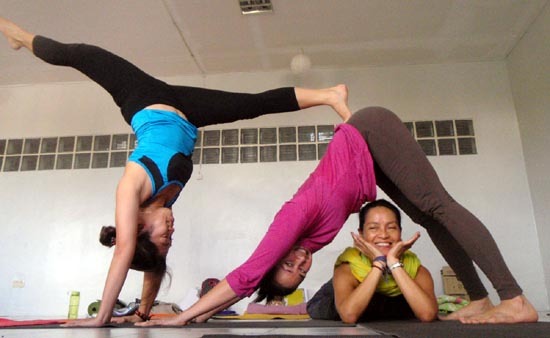 I hope to also join her classes at Yoga Hub especially for Ashtanga yoga. Thank you, Jeanne! (August 20, 2012) It was my wife who wanted to have yoga at home because she was too ashamed to go to a studio or group yoga. Since I don't want to join, my wife invited her sister to start yoga with her. It was me who recommended Jeanne to them but I was not interested in yoga. But after a few minutes of watching them do some yoga poses and stretching, I cannot help it but to join the fun. It was then that I realized that yoga is as much an exercise as stretching and balance because sweat started dripping from all over my body. Since then (about three months past) we have increased our practice from once a week to twice a week already. (July 12, 2012) Jeanne's passion for learning and teaching yoga in all its aspects - physical, emotional, mental, and spiritual - is overflowing. Thus, training with her naturally brings out the joy within and one eventually learns to look at oneself and the world with compassionate and mindful yogic lenses. Really enlightening and highly recommended! (July 12, 2012) I've only attended Jeanne's studio classes (not the private sessions) but I consider her a teacher's teacher. I've been doing yoga over 10 years now, finished 200 hours of teacher training course (Empath Yoga), met a lot of yoga teachers along the way, but it's a treat to meet a yoga teacher who lives life and views life in a practical yogic way. Her positive energy radiates, and that is all reflected in her teaching style.